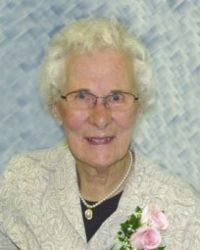 It is with a deep sense of loss that we, the family of Kathleen Nora Anderson (Reece), announce her passing on June 25, 2012 at the age of 92, at the Boundary Trails Health Centre. Gramma Nora is lovingly remembered by her daughter Vivian (Marcel) Jacques, her son Robert Anderson, 'adopted daughter' Lynda (Robert) Pritchard, Grandchildren: Nicole Jacques, Sondra and Reece Anderson (and their mother Betty), Darren (Roxanne), and Allen (Rachel) Pritchard. She was predeceased by her beloved husband Mervyn of 45 years and Michael Pritchard in 1998. Nora was born on November 13, 1919 in Roland, Manitoba where she spent her whole life and was a dedicated part of the community. Merv and Nora worked the family farm just outside of town until 1987 when they moved into Roland. She has always been a devoted member of the Roland United Church and UCW. She enjoyed working with the youth as a Sunday school teacher and 4H leader. Nora derived great pleasure from the past times of knitting and crocheting, to which many were the recipients of her fine work. She was very positive, seeing nothing but good in everyone and the bright side of everyday, and that is why she was "Gramma Nora" to all who knew her. A celebration of her life will be held at 11:00am on Friday June 29, 2012 at the Roland United Church with a private family burial prior to the service. In lieu of flowers, memorial donations can be made to Boundary Trails Health Centre or the charity of one's choice.